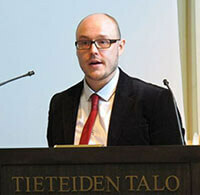 Tuomas Tepora, Ph.D., is a postdoctoral fellow at the University of Helsinki. He has published on the cultural history of war and on the history of emotions related to the Finnish war experiences in the 20th century. The Finnish Civil War 1918 offers a rich account of the history and memory of the conflict between socialist Reds and non-socialist Whites in the winter and spring of 1918—and traces the legacy of this bloody war. The volume brings together political and social history—with the cultural history of war, memory studies, gender studies, history of emotions, psychohistory and oral history. Among themes discussed are violence and terror, and enemy images. Premised on the interplay between national flags, violence and sacrifice, this article sheds new light on the significance of flag culture in nation-building. It specifically highlights the role of the Finnish flag in directing violence outwards from Finnish society after the Civil War of 1918. The new national flag introduced after the war came to symbolize an ideal of oneness which found its expression in a propagated willingness to make sacrifices for the collective. The memory of fratricidal violence was externalized from the national space and transferred onto the red flags associated with Soviet Russia. During the Second World War the symbolically unifying ‘sacrifice’ was transformed into real sacrifice, giving birth to a new symbolism of the Finnish flag. The article concludes that national flags have an important role in societies’ boundary formation, connecting civil society to the state, as well as the individual to the public realm. After Finland gained independence in December 1917 and a couple of months before the Civil War broke out, an intensive debate started in the Finnish bourgeois press concerning the national flag. There was no consensus over the colors or the insignia it should bear. The debate was emblematic of the chaotic situation pre-war, and could be seen as a prelude to the real fighting; Finnish society lacked any collective symbol around which to unify. The socialist press intensified the elites’ debate by ridiculing the bourgeois efforts (Tepora 2006:92-4). The short but bloody Civil War started as a socialist revolution and ended up in a bourgeois victory in May 1918. Over the ninety years since the war its historiography has been widely debated. At present, however, there is a somewhat broad consensus that the war signified an internal power struggle between middle classes and socialists catalyzed by the October Revolution in Russia. Casualties were high: nearly 37,000 people were killed altogether on both sides out of a population of 3.5 million. Many of those killed met their deaths behind the front as casualties of purges conducted by both sides. The biggest number of deaths, however, occurred in prison camps created for the defeated ‘Reds’ after the war. The war resulted in a divided society. The victorious ‘Whites’ called it the War of Independence. As a denial of the war’s internal nature, the Whites – partly in good faith – attributed its cause to the Russian Bolsheviks. In reality, the actual Bolshevik aid to and participation in the war remained relatively small. The German military participation, on the other hand, helped to decide the war in the Whites’ favor (Upton 1980; Alapuro 1988:143-96; Tikka 2004). In the end, the Civil War also resulted in a heraldic change. The red and yellow colors of the coat of arms of Finland were replaced by a blue and white flag. The new official colors of the Finnish flag had previously been associated with conservative Finnish nationalists whereas the colors of the coat of arms had been cherished by the liberals and the cultural avant-garde, as well as the Swedish-speaking middle and upper classes. The now ousted red-and-yellow flag, or the so-called ‘lion flag’, had prior to the Civil War been used also as a symbol of resistance to the Russian rule. The conservative blue-and-white cross-flag combined specifically ‘Finnish’ bicolor with the Nordic cross as a concession to the Scandinavian-minded groups. (1) The flag became a fierce antithesis to the atrocities of the Civil War. It was a symbol of purity and youthful innocence; its obvious opponent being the red flag of the socialists and of internationalism. The experience of the divisive, fratricidal violence was thus written out of the official national narrative. The popular sacrifice of the Second World War – or the myth of the popular sacrifice – however, was to invest the Finnish flag with a new symbolism. The purpose of this article is to explore how the Finnish Civil War, which directed the violence inward into the society instead of outward, was dealt with on the level of collective symbols, particularly the Finnish flag, during the interwar period. What was the impact of the Second World War when the source of violence was placed, in the popular imagination, outside of one’s own society? In a broader sense, this paper aims to discuss the role of national flags in creating and maintaining an emotional contact with the collective, or the nation-state. The discussion is based on various media sources produced during the period concerned. National flags are used as functional artefacts indicating, for example, the nationality of a vessel at sea. The most convenient way to describe the meaning of the flag has usually, however, been its political aspect as a symbol of power and/or sovereignty. The political power and sovereignty of the nation can be manifested not just by the ‘waved’ flag of state celebrations but also by the ‘unwaved’ or banal flag of everyday life (Billig 1995). These manifestations, however, cannot merely be considered as political acts, for they are also essential in making sense of the citizens’ sense of belonging to the nation. In other words, national celebrations as well as the routine, everyday ‘lagging’ of the nation in the media, in which national symbols play an important part, form a context out of which people experience their environment (cf. Skey 2006:146-8; Billig 1995:45). Although it is problematic to argue that national flags are collectively charged with emotions they nevertheless represent some shared feelings and values of a collective, which, of course, are often manifested by politically and culturally hegemonic groups. Thus the so- called collective memories they carry are easy to confuse with the ideals constructed by leading groups in societies (cf. Conino 1997; Winter and Sivan 1999; Winter 2006:3-4, 9, 11). National flags have received relatively little scholarly interest in the field of history and memory outside the more or less standard flag histories. (2) The relative lack of interest probably has to do with the fact that national flags are usually regarded as political symbols representing the state. The state’s role is usually that of power. It tries to reduce often traumatic memories into a linear and redemptive narrative which in fact robs those memories and experiences of their political power, or reinforces the power of the nation- state (Edkins 2003). The flag is indeed often regarded as an unchanging piece of cloth, which manifests the sovereignty of the state and the official idea of a fatherland or a motherland in a given time and is therefore of little interest to students of history and memory. The story does not remain unaltered, though: there are continuities and discontinuities in the ideals attached to flags as well as complete heraldic changes symbolizing the reshaping of the social structure. Numerous studies have recently located commemorative work within civil society and in small groups. As Jay Winter and Emmanuel Sivan (1999; cf. Winter 1995:40-4) have put it, nations do not remember, individuals do. Individuals form small groups to carry their memories and experiences, otherwise they would be privatized. Collective memories cannot be entirely socially determined, for in that case the agents of memory do not matter. Therefore it seems that it is the multivocal action of civil society which is crucial in carrying on collective memories (Winter and Sivan 1999). At the same time, within the context of the nation-state, the agents of these often contesting experiences and memories are destined to use constructively many of the same myths and traditions present in society in order to form a coherent view of the past (cf. Smith 2003:168-72). According to Émile Durkheim’s seminal totem theory, totemism is the very basic form of religious practice in which the community worships itself. The solidarity of the group is maintained by regular rites, which define the realms of the sacred and the profane. The rites create reality by forming the group’s worldview (Durkheim 1915). It is argued that Durkheim’s theory is applicable to nationalism: the nation itself being the deity of worship (Smith 1991:77-8). In the Australian tribal communities researched by Durkheim the collective ‘sentiments’ created by societal activity were projected onto the external objects, totems. In a similar way, the national flag is one of the most important symbols of the nation and can be seen as a collective and sacred symbol invested with powerful emotions. For Durkheim collective rites were adequate for generating solidarity between group members. It is, however, perhaps more fruitful in the context of nationalism to look at the question from the viewpoint of collective memories. In this way it is possible to shed light on the problem of how certain important and collectively experienced events shape the symbolism of national symbols. This may be done by focusing on the significance of remembrance manifested in national celebrations and looking at the position of inanimate symbols in group-formation and nation-building. I suggest that in addition to the national flag’s aforementioned functional and political aspects the national flag can be seen as a totemic, sacrificial flag when it becomes a container of very powerful emotions during times of crisis. The glory attached to national flags has often been created by wars set in the heroic past and the sacrifices they demanded. Carolyn Marvin and David W. Ingle (1999) have studied the American flag as a symbol signifying blood sacrifice for the nation. According to them the Stars and Stripes symbolize not only past but present sacrifices and bind the individual citizen into the national collective, a social body. It is a banner that periodically calls people to sacrifice themselves for the collective and it is also used in symbolizing the transformation of violence into sacrifice. Marvin and Ingle’s approach has been criticized in that it treats the nation as a one big ‘tribe’ caught in an endless cycle of sacrifice (Siltala 2006). What seems to be lacking is the potential for change through the agency of the people. Identifying with the flag, or the nation, is a two-way street. Sacrifice by dying for one’s country or working for it selflessly can be experienced as sincere and instrumental at the same time. The sacrificial flag has to offer something in exchange. This can be a feeling of immortality, an intense identification with the collective resulting in the loss of individual boundaries, or simply a feeling of safety within a group sharing the same symbol, etc. (Volkan 1988; Volkan 1997; Alford 1989:57-103). National and local ceremonies around the flag can be seen as commemorating past sacrifices. They also ritually re-establish the cohesion of the group. Excessive display of national, party and state symbols has been attributed to totalitarian societies but more or less democratic societies also put out flags when under threat. In the next section I will explore the fundamental questions posed in the introduction. I will highlight the process through which the Finnish flag became a sacrificial symbol and how it was used in making violent memories more understandable. I will also explore the development of the Finnish flag culture and its notions of sacrifice and the role of youth. It must be remembered, though, that all of the aforementioned contexts of the flag were present at the same time. It is a popularly held myth that the heraldic change of 1918 occurred due to the rejection of the color red as associated with socialism. But the change certainly had other aspects as well. The youth was given an important function in creating a sacrificial will attached to the new flag. The young liberals who naturally were on the bourgeois side during the war collectively changed their preferred flag and symbolically returned under the blue-and- white totem of their fathers. The red color of freedom had become the color of fratricide in many a young liberals’ vocabulary. Many people felt that liberal thoughts had paved the way for socialism (Onerva 1918). The color red, in turn, was heavily invested with materialism by the middle class. Emotionally it became a symbol of evil spirits and selfishness, a sharp contrast to the idealized self-sacrificing purity of the blue-and-white flag (Aamulehti1918a:2; Aamulehti 1918b:5). The Civil War was portrayed as a major interruption to Finland’s peaceful growth as a nation preceding the war and resulted in an independence marred by a bitter taste, experienced on both sides. An ideal of oneness developed around the national symbol. This oneness could only be held intact by constantly strengthening the nation’s willingness to make sacrifice. Despite the heraldic change the new national flag heralded the continuity of the nation, albeit at the same time trying to define Finnishness as separate from the Swedish legacy. The Swedish-speaking middle class still continued to cherish the red-and-yellow flag as their symbol. They did not see the red color as threatening. René Girard has described a situation where a predominant sacrificial order has collapsed as a sacrificial crisis. This means that violence rages freely without making distinctions: brothers turn against brothers as the aggression springs from within the society. The traditional hierarchy of violence and its control has been overturned; the relationship between the victim and the victimizer has been blurred. The discharge from the threatening situation lies in the finding of a suitable surrogate victim. A successful and unanimously chosen victim will return the hierarchy of violence and steer the devastating violence outside the society (Girard 1995). It is possible to see the Finnish Civil War as a sacrificial crisis, in which violence has been freed from the old prohibitive mechanisms. The pre-war lack of a collective symbol can also be interpreted as signifying the loss of sacrificial order. The reciprocal violence of the war continued after the end of the actual fighting. It had to be unmade by strengthening the power of the national symbols and the unanimous willingness to make sacrifice. The most important aspect of this phenomenon was that the inborn nature of the Civil War was denied by strengthening the symbolic power of the scapegoat across the border, Soviet Russia. The evil of socialism associated with the workers’ red flags was externalized from the national space and directed in the form of an ethnic hatred of Russians onto Bolsheviks, who were seen to be influencing the domestic socialists. The national flag was used in re-establishing the linearity of time and the national narrative by denying the traumatic essence of fratricide. This reflected not only the needs of the state but also many of the so-called common people trying to move on with their ordinary lives. The national flag became the ultimate symbol of harmonious and uncontradictory unity. The flag was dyed with pure colors; it did not contain any shades of grey. The losing side remembered their sacrifices in their pure red flags of ‘struggle and … peace’ (Suomen Sosialidemokraatti 1923:3; cf. Työväenjärjestöjen Tiedonantaja 1926:1). The 1920s was a calm before the storm until right-wing extremism arose in Finland in 1929. The movement named after the Ostrobothnian town Lapua was able to raise broad political support behind its anti-Marxist agenda, which aimed at eradicating communism from the country but which subsequently was directed at the social democrats as well. The movement based its demands on the values of the ‘white front’ created after the Civil War and its core supporters were veterans of 1918. The movement’s lawless and radicalized practices, however, quickly alienated the moderate rightist groups. Before the Lapua movement was banned after a miserably failed coup in Mäntsälä in 1932, its pressure on the regime had resulted in anti- communist laws. From its ruins was established a political party, the Patriotic People’s Movement (Isänmaallinen kansanliike, the IKL), to continue the Lapua movement’s goals but it never managed to raise substantial support. The goal of forming Greater Finland (Suur-Suomi) by annexing Eastern Karelia to the nation-state became important. Differing from the classic definition of fascism, the ideology of Finnish fascism was strongly rooted in conservatism and Lutheranism (Rintala 1962; Uola 1982; Siltala 1985; Karvonen 1988; Kasekamp 1999:590-593, 599). The hot-tempered politics and violent memories of the Civil War were largely transformed into a fight between symbols as violent outbursts remained scarce. The Lapua movement forcefully smuggled communists or ‘unpatriotic’ people to the Soviet border or its own support areas and forcibly shut down communist and social-democratic Workers’ Halls. In the end, the social tension was fought between the national flag and the worker’s contesting flags. In the early 1930s Workers’ flags were taken down from the local Workers’ Halls by local vigilantes and authorities. Many of the Workers’ Halls were also symbolically (re)conquered by forcefully placing the national flag on top of them especially on 1st May, Midsummer Day and on 16th May commemorating the victory parade ending the Civil War (Kansan Voima 1933:3; Siltala 1985:121-3; Huttula 2000:127-8). For the far right these Workers’ Halls were outposts of a threatening alien power situated within the sacred national territory and seen as a reminder of an unfinished business left from the Civil War (Siltala 1985:460-1). During the early 1930s the national flag was also attacked by the left (Tepora 2006:100). The use of political flags other than the Finnish flag was prohibited from the early 1930s until the Second World War along with political uniforms in a ruling which targeted mainly the far right. In addition to the cleavage between social classes, the language struggle between the Finnish- and Swedish-speaking peoples was galvanized, particularly by the nationalistic student organization, the Academic Karelia Society (Akateeminen Karjala-Seura). Swedish, regarded as the language of the elite, had become the language of the minority nevertheless preserving its status as an official language. For a number of the Finnish-speaking nationalists this represented a social evil (Alapuro 1973). Interestingly, the language struggle found a platform in flag controversies as well. Some of the Swedish-speaking institutions, such as schools, refused to hoist the national flag during national celebrations or demonstratively put out the red- and-yellow flag in localities where language relations were tense. Privately red-and-yellow flags were displayed abundantly (Aika 1933:2; Villstrand 2006:235-6, 242-3, 254-6). The profound splits within society began gradually to be overcome although it remained divided. The regime protected itself against the pressure from the far right and the parliamentary system endured. This was a crucial factor in overcoming the social divisions although Finnish society could not be considered as entirely democratic as strikes and trade unions were deemed as communist and therefore were either prohibited or ignored. In the 1930s the Finnish flag was also contested within the middle class after groups associated with the political center were able to differentiate themselves from the flag’s right-wing use, which they saw as a desecration of the flag (Helsingin Sanomat 1934:4, 6). Emblematically the IKL tried to monopolize the commemoration of the fallen Whites of the Civil War under their blue-and-black party colors. Moreover, some of the local workers’ associations used the national flag during national celebrations thus claiming to be part of the nation, if not the real essence of it, as the Social Democratic Party represented at least one-third, if not more, of the population. In 1937 social democrats and the centrist Agrarian party formed a ruling ‘red-earth coalition’ which was a step towards the realignment of the Finnish political structure. In the late 1930s many of the IKL supporters experienced the national celebrations as foreign to the pure ideals of the ‘white front’ (Helsingin Sanomat 1937:7). Interestingly, the development of the unified flag culture really started only after people began to look for new sources of identification in the late 1920s to which the rise of right-wing extremism was one answer. Multivocal action in civil society was met at the same time with a unifying current in the form of standardized flag ceremonies. In addition to widely researched primary education, middle-class youth movements and academic movements (Alapuro 1973; Uola 1982:292-304; Tuomaala 2004; Nevala-Nurmi 2006), the promotion of flag culture became an important factor in Finnish nation- building. There was much work to do as it was apparent that there were many people, especially in the countryside, who in the 1920s did not have any idea of what the Finnish flag looked like (Kajanti 1983:246). The work was taken seriously. The national flag was present in various occasions: the young republic celebrated everything from nationally prestigious sports events to country fairs under the national totem. The flag was often portrayed in postcards diffusing the national colors all over the country. Newspapers encouraged the public to put out flags during national celebrations. Special and popular flag ceremonies were held on Independence Day, 6th December, and on Midsummer Day (Day of the Finnish Flag). These ceremonies were created and in Helsinki also organized by a voluntary civil organization called the Union for Independence (Itsenäisyyden Liitto). This also illuminates the linkage between civil society and the state represented by the flag. The Union for Independence was a bilingual organization representing right-wing academics and financial elites and it was built around the idealistic, if not illusory, purpose of reconciling the nation by unifying it under one symbol, regardless of class distinctions or mother tongue. Flag speeches were an important part of these ceremonies. Speakers included influential figures of both the Finnish and Swedish-speaking rightist political and cultural elite as well as student leaders. Although the Union for Independence was in the 1930s closely associated with the far right, the periodical flag ceremonies interestingly attracted a much wider middle-class audience than just the far right. At best these ceremonies gathered a few thousand spectators in Helsinki and they were occasionally broadcast all over the country in the late 1930s (Tepora 2006:101-2). For this article I have analyzed flag speeches given in Helsinki and published in newspapers alongside with other writings related to the subject in different media. The findings can be grouped into four recurrent and illuminating patterns which reflect on the idea of the flag as the ultimate representation of the nation. Firstly, the nation was defined by what it was not. The communists were designated as the definers of the national boundaries of the totem. ‘Only communists do not put out a flag on Midsummer Day’, ran one of the slogans (Tepora 2006:105). Communism was seen as decaying the national body- politic. One speaker for example referred to it as a ‘purulent wound’ in the flesh of the nation (Uusi Suomi 1930a:3). The group’s boundaries were sometimes manifested by bodily concepts. Communism represented an anomaly; its adherents were people without form (cf. Douglas 1996:100-1, 115-29). Moreover, it became a category the most important characteristics of which were selfishness, putting one’s own desires ahead of the collective – in short, unwillingness to make sacrifice (cf. Uusi Suomi 1933:1). The bourgeoisie tried to symbolically integrate the moderate social democrats that represented the majority of the Finnish left, under the national totem. Communists in turn were left alone as they were important as enemies – mirror images. Secondly, fathoming Finland as a geographical body was emblematic to the development of flag culture. The flag enthusiasts emphasized the propagation of flag culture to the Swedish-speaking people but it seems that the Orthodox population in Eastern Finland was targeted as well (cf. Raivo 1996:110-133) along with Northern Finland in order to integrate them into the heartland. The national flag consecrated and fenced in the sacred ground. It was even customary by some flag propagandists to rent an aeroplane on Midsummer Day in order to check the density of flags in the countryside (Viklund 1927a). Symbolic boundaries created by the flags were important. Strengthening not only the physical boundaries of the nation but the mental ones as well made the situation simple. A clear- cut view on the external world perhaps balanced the inner turmoil caused by the hot-tempered domestic politics. Under the flag the modern nation could at least momentarily experience itself as a holistic tribe (cf. Anderson 1991). Under the flag everyone, rich or poor, was said to be equal (Viklund 1927b:94; Itsenäinen Suomi 1936:162) but at the same time everyone had his or her unquestionable place in the hierarchy. Flag ceremonies were rituals where the body-politic and the body of the citizen momentarily fused together, feeding off each other. The third conclusion is that under the flag politics in general were deemed bad. They represented selfishness which could be interpreted as a wish for separation from the imaginary collective. The real challenge was living without personal desires which would threaten the illusory harmony of the collective. Living was challenging because it was a way of sacrifice, too. Sacrifice did not just mean actual bloodshed but selfless work for the fatherland and family. Unselfish deeds demanded constant self-reflection. The national rhetoric insisting on the unity of a nation can be seen in its purest form in these flag speeches and writings. The flag was referred to as being the ‘only symbol that invites and gathers people’ (Uusi Suomi 1930a:5; Uusi Suomi 1931:1; Hufvudstadsbladet 1934:3, 8). The flag was something extra-political; it symbolized a rejection of a fractured society. Independence gained by fratricide required a completely fresh start. None of the historical or mythical reference points in the past could provide a clear and redemptive way out of the situation. What was missing in the idealistic speeches given under the flag was that adopting the ideals of the national flag was a political act as well. The fourth characteristic of the civil religion around the Finnish flag is perhaps the most important. The sacrifices of the forefathers also demanded sacrifices from the present and future generations. The past sacrifices commemorated under the flag involved also those of the distant past. The flag established a connection between forefathers, who had fought in the wars of the Swedish Kingdom, and present patriotic citizens preparing for future wars and everyday life (Klemetti 1933). Moreover, the flag propagandists saw that an active, vital youth would bear the responsibility of selfless work for the fatherland (Talvio 1929; Itsenäinen Suomi 1929:98-9; Itsenäinen Suomi 1930:86). For them the success of these nation-forming efforts ultimately lay in how well the youth adopted the notion of willingness to make sacrifices for the nation. Interestingly, at the same time the vitality associated with the youth was perceived as threatening the collective (Hakkapeliitta1930:682). The attitude to youth was split. It was romantically perceived as a self- sacrificing and innocent group as well as a subject-forming and virile power seeking independence from the parent-nation-state. The insistence on youth derived from its imagined ability to rejuvenate the nation, to inject it with life (cf. Siltala 2006). The flag was used in capturing this perceived life force for nationally constructive purposes. The deep divisions of society were widely, albeit temporarily, felt to have been resolved by the eruption of the Winter War in 1939 between the Soviet Union and Finland. Symbolic sacrifice under the national flag was transformed into the real sacrifice of the youth as well as the establishment of the renewed inner boundaries of the nation. The socialists were symbolically integrated into the nation following the national flag, partly by their own initiative. During the Second World War the national flag officially became the symbol of national unity. The trivial ‘I’ disappears as ‘we’ comes instead. Every single drop of blood shed to the soil is our blood, every single tear of a child is our child’s tear and even the smallest of deeds is meaningful to our family, the Finnish nation (Uusi Aura 1939:3). The Winter War was also portrayed as a collective coming of age. The nation was seen to leave its adolescence behind through engaging in a purifying war (Bergroth 1939). The socialists were called under the national flag during the war and many of them answered the call. During the Winter War the trade unions were officially rehabilitated and after the war the government freed the use of political flags (SuomenSosialidemokraatti1940a:3; SuomenSosialidemokraatti1941:1-2). This, of course, did not eradicate social constraints within the society. The result was a temporary symbolic integrity under one flag against an external enemy, an integrity which was also questioned during the so-called Continuation War in 1941-1944. Although the Second World War was a massive trauma for many individuals, the Winter War was often portrayed on the collective level as full of continuous heroic deeds, despite the fact that it resulted in Finland losing the eastern province of Karelia. The socialists, significantly, organized their own flag ceremonies for the national flag and the socialist press heralded the Finnish flag as a unifying symbol (Suomen Sosialidemokraatti 1940b:1, 8; Suomen Sosialidemokraatti 1940c:8). Whereas the question about the national flag had twenty years earlier occupied primarily the minds of the elite, it was now openly celebrated also by the so-called common people. In a Girardian sense the distinctions between classes were briefly abolished, just like twenty years earlier. But this time the aggression was not directed inwards but outwards against a collectively signified enemy – or at least this was the myth created during and immediately after the Winter War. Finnish communists were still seen by the majority as boundary markers now concretely associated with the enemy. Already before the Second World War some of the remains of the socialists fallen in the Civil War had been exhumed and placed in ‘holy ground’ and during and immediately after the war this became usual practice. For the first time in 1940 the fallen socialists of 1918 were commemorated on the state level (Peltonen 2003:226-8). Past, present and future sacrifices were symbolically integrated into a whole. The Winter War in particular signified the unmaking of the Civil War. Popular sacrifice – unanimously chosen victims – masked the violent past and gave new tools for nation-building. Although post-Second World War Finland saw a political shift to the left and the official commemoration of the wars was again subject to political reshaping – as it always is – the idea of a nation reborn out of the mythical unanimity of the right, the center and the left during the Winter War survived in the symbolism of the national flag. In many ways the Finnish flag lost its ‘waved’(cf. Billig 1995:39-42) appeal after the communists adopted its use to their 1st May demonstrations during the late 1940s (Alapuro 1997:42). There was little left to contest. In a broader historiographical context it seems that national flags alone can be successful at generating an emotional contact with the nation-state and therefore their study should not be neglected. National flags can be seen as mediating symbols between civil society and the state as well as between different groups within civil society. Therefore they are not just emblems of the political power of the state or the banality of everyday nationalism. National flags can also become containers of powerful sacrificial emotions and thus they have an important role in societies’ boundary formation. In particular this paper has described the heraldic change and the attachment of sacrificial will to the Finnish flag after the Civil War of 1918. The Finnish flag became the symbol of innocence and youthfulness and it masked the reciprocity of home-grown violence by directing the memory of the violence into the socialists’ red flags of bloodshed. At the same time it was a site of remembrance and forgetting. The ideal of the flag as associated with purity and innocence was used in establishing the linearity of time and the coherent narrative of the nation after a traumatic event. Sacrifices were remembered and guilt arising from reciprocal violence was forgotten. The ideas of sacrifice and youth were also intertwined. The nation demanded idealistic selflessness and this task was symbolically delegated to the youth. The national flag was used in creating a unified ideal of the nation, which was celebrated in special flag ceremonies. However, the Finnish flag also represented enforced oneness in a divided society. The national flag contested the workers’ flags. In the flag ceremonies of the interwar period the Finnish flag was represented as a sacrificial symbol. It connected the past sacrifices of the nation to the anticipated sacrifices in the future. Sacrificial will for the nation often found attached to national flags should also be understood in a broad sense not just meaning actual bloodshed but selfless devotion to the cause of the nation. The flag culture developed out of the initiative of a voluntary organization. The national flag connected civil society to the state as well as the individual to the public realm. The flag did not just represent official ideals of the state, but was rather a mediator between two conflicting ideas, the one rising from the experiences of the Civil War and from the politically hot-tempered inter- war period and the other being the officially held ideal of the united nation. The dividedness of the nation was at least momentarily experienced to have been dissolved by the eruption of the Winter War in 1939. The inward-bound animosity was redirected on to the external enemy. The myth of the popular sacrifice resulted in the birth of a new symbolism for the national flag. Finland’s coat of arms depicting a yellow sword-slashing lion on a red background dates back to the late sixteenth century and was used as the emblem of the eastern parts of the Swedish Kingdom. The emerging Finnish nationalists, the Fennomans, adopted blue and white, the colors of the Russian Navy, as their party colors in the early 1850s as a gesture of loyalty to the Tsar during the Crimean War. The Fennomans held a close relationship to the Emperor in exchange for a favorable policy towards the advancement of the goals of the Finnish nationalist movement. In the early twentieth century, in turn, the colors of the coat of arms were revived among the younger generation of Finnish nationalists, the Young Finns, as symbols of the constitutional rights of Finland under the homogenizing tendencies within the Russian Empire. Red-and-yellow flags depicted a yellow lion on the red background or sometimes they were composed of a yellow Nordic cross on the red background, etc. Many of the Swedish-speaking people regarded red and yellow as the original colors of Finland, and this continued long after the heraldic change. These colors became the colors of the Swedish Folk Party (Svenska folkpartiet). For previous studies on national flags as ‘realms of memory’, see Girardet (1984) on the French tricolour. Bonner (2002) has shed light on the sacrificial symbolism and passions mediated by the Confederate flags during the American Civil War. On the symbolism of the Finnish flag, see Klinge (1981:7-63) and Kajanti (1983). It must be kept in mind that in totalitarian societies the distinction between the state and civil society cannot be drawn so clearly. ‘Collective memories’ are always the property of the state (Merridale 1999). Aamulehti. 1918a. ‘Suomen lippu’, 23 May: 2. Aamulehti. 1918b. ‘Läheltä ja kaukaa’, 30 May: 5. Aika. 1933. ‘Liputusvälikohtauksia Kristiinassa ja Turussa’, 17 May: 2. Alapuro, Risto. 1973. Akateeminen Karjala-Seura. Ylioppilasliike ja kansa 1920- ja 1930-luvulla. Helsinki: WSOY. Alapuro, Risto. 1988. State and Revolution in Finland. Berkeley: University of California Press. Alapuro, Risto. 1997. SuomenälymystöVenäjän varjossa. Helsinki: Tammi. Alford, C. Fred. 1989. Melanie Klein and Critical Social Theory: An Account of Politics, Art, and Reason Based on her Psychoanalytic Theory. New Haven and London: Yale University Press. Anderson, Benedict. 1991. Imagined Communities: Reflections on the Origin and Spread of Nationalism. Revised Edition. London: Verso. Bergroth, Kersti. 1939. ‘Suomen täysi-ikäiseksi tuleminen’, Uusi Suomi, 6 December: 4. Bonner, Robert E. 2002. Colors and Blood: Flag Passions of the Confederate South. Princeton: Princeton University Press. Conino, Alon. 1997. ‘Collective Memory and Cultural History’, The American Historical Review 102: 1386-1403. Douglas, Mary. 1996 . Purity and Danger: An Analysis of the Concepts of Pollution and Taboo. London and New York: Routledge. Durkheim, Emile. 1915 . The Elementary Forms of the Religious Life. Trans. Joseph Ward Swain. London: Allen and Unwin. Edkins, Jenny. 2003. Trauma and the Memory of Politics. Cambridge: Cambridge University Press. Girard, René. 1995 . Violence and the Sacred. Trans. Patrick Gregory. Girardet, Raoul. 1984. ‘Les trois couleurs. Ni blanc, ni rouge’, in Pierre Nora (ed. ), Les lieux de mémoire I. La République: Symbols. Paris: Gallimard. Hakkapeliitta. 1930. ‘Lipun alta ja lipun alle’, 27 May: 682. J. Ditter Jr. and Vida Yazdi Ditter. New York and London: Harper and Row. Helsingin Sanomat. 1934. ‘Vappu on juhlittu ja marssit marssittu’, 3 May: 4, 6. HelsinginSanomat. 1937, ‘Juhlittiin’, 8 December: 7. Hufvudstadsbladet. 1934. ‘Gemenskapstanken blev på självständighetsdagen med kraft understruken’, 8 December: 3, 8. Huttula, Tapio. 2000. Nauloilla laadittu laki. Työväentalojen sulkemiset 1929-1932. Helsinki: SKS. Itsenäinen Suomi. 1929. ‘Suomen lippu ja Manun torppa’, 8 June: 98-99. ItsenäinenSuomi. 1930. ‘Partiolaiset lippukulttuurin vaalijoina’, 18 June: 82. ItsenäinenSuomi. 1936. ‘Siniristilippu’, 24 June: 162. Kajanti, Caius, ed. 1983. Suomenlippukauttaaikojen. Helsinki: Siniairut. Kansan Voima. 1933. ‘“Sanoista tekoihin”’, 18 May: 3. Karvonen, Lauri. 1988. From White to Blue-and-Black: Finnish Fascism in the Inter-War Era. Helsinki: Finnish Society of Sciences and Letters. Kasekamp, Andres. 1999. ‘Radical Right-Wing Movements in the North- East Baltic’, Journal of Contemporary History 34: 587-600. Klemetti, Heikki. 1933. ‘Suomen lippu’, Ajan Suunta, 16 May: 8. Klinge, Matti. 1981. Suomen sinivalkoiset värit. Kansallisten ja muidenkin symbolien vaiheista ja merkityksestä. Helsinki: Otava. Marvin, Carolyn and Ingle, David W. 1999. Blood Sacrifice and the Nation:TotemRituals and the American Flag. Cambridge: Cambridge University Press. Merridale, Catherine. 1999. ‘War, Death, and Remembrance in Soviet Russia’, in Jay Winter and Emmanuel Sivan (eds. ), WarandRemembrancein the Twentieth Century. Cambridge: Cambridge University Press. Nevala-Nurmi, Seija-Leena. 2006. ‘Girls and Boys in the Finnish Voluntary Defence Movement’, Ennen & nyt 3-4/2006, http://www.ennenjanyt. net/2006_3/nevala.html, accessed 24 October 2007. Onerva, L. 1918. ‘Ihanteet ja todellisuus’, Helsingin Sanomat, 19 May: 7. Peltonen, Ulla-Maija. 2003. Muistin paikat. Vuoden 1918 sisällissodan muistamisesta ja unohtamisesta. Helsinki: SKS. Raivo, Petri J. 1996. Maiseman kulttuurinen transformaatio. Ortodoksinen kirkko suomalaisessa maisemassa. Oulu: University of Oulu. Rintala, Marvin. 1962. Three Generations: The Extreme Right Wing in Finnish Politics. Bloomington: Indiana University Press. Siltala, Juha. 1985. Lapuan liike ja kyyditykset 1930. Helsinki: Otava. Siltala, Juha. 2006. ‘National Rebirth out of Young Blood: Sacrificial Fantasies in the Finnish Civil War, 1917-1918’, Scandinavian Journal of History 31: 290-307. Sivan, Emmanuel and Winter, Jay. 1999. ‘Setting the Framework’, in Jay Winter and Emmanuel Sivan (eds. ), War and Remembrance in the Twentieth Century. Cambridge: Cambridge University Press. Skey, Michael. 2006. ‘“Carnivals of Surplus Emotion?” Towards an Understanding of the Significance of Ecstatic Nationalism in a Globalising World’, Studies in Ethnicity and Nationalism 6, 2: 143-161. Smith, Anthony D. 2003. Chosen Peoples: Sacred Sources of National Identity. Oxford and New York: Oxford University Press. SuomenSosialidemokraatti. 1923. ‘Vapunvietto Helsingissä’, 2 May: 3. SuomenSosialidemokraatti. 1940a. ‘Kevätjuhlamme päivänä 1940’, 1 May: 3. SuomenSosialidemokraatti. 1940b. ‘Siniristilippu ja puoluelippumme ovat vapaan kansan ja valveutuneen työväenluokan symbooleja’, 26 June: 1, 8. SuomenSosialidemokraatti. 1940c. ‘Juttelimme eilen’, 6 December: 8. SuomenSosialidemokraatti. 1941. ‘Työväki vietti vappua vakavin, rohkein mielin’, 2 May: 1-2. Talvio, Maila. 1929. ‘Isänmaan lippu’, Itsenäinen Suomi, 8 June: 90-91. Tepora, Tuomas. 2006. ‘Elää ja kuolla lipun puolesta. Suomen lippu uhrisymbolina ensimmäisessä tasavallassa’, in Tiina Kinnunen and Ville Kivimäki (eds. ), Ihminen sodassa. Suomalaisten kokemuksia talvi- ja jatkosodasta. Helsinki: Minerva. Tikka, Marko. 2004. Kenttäoikeudet. Välittömät rankaisutoimet Suomen sisällissodassa 1918. Helsinki: SKS. Tuomaala, Saara. 2004. Työtätekevistä käsistä puhtaiksi ja kirjoittaviksi. Suomalaisen oppivelvollisuuskoulun ja maalaislapsuuden kohtaaminen 1921-1939. Helsinki: SKS. Työväenjärjestöjen Tiedonantaja. 1926. ‘Soi Vapun virsi’, 30 April: 1. Uola, Mikko. 1982. Sinimusta veljeskunta. Isänmaallinen kansanliike 1932-1944. Otava: Helsinki. Upton, Anthony F. 1980. The Finnish Revolution 1917-1918. Minneapolis: University of Minneapolis Press. UusiAura. 1939. ‘Sankaruuden puutarha’, 3 December: 3. Uusi Suomi. 1930a. ‘Suomen lipun päivä’, 26 June: 5. Uusi Suomi. 1930b. ‘Onnistunut lippujuhla Tähtitorninvuorella’, 8 December: 3. Uusi Suomi. 1931. ‘Itsenäisyyspäivän juhlallisuudet kokosivat kaikkialla valtaisat yleisöjoukot’, 8 December: 1. Uusi Suomi. 1933. ‘Suomen lipun päivää vietettiin juhannuksena kautta maan’, June 26: 1. Viklund, Arvo. 1927a. ‘Ensimmäinen Suomen lipun päivä’, Itsenäinen Suomi, 1 July: 122-123. Viklund, Arvo. 1927b. Siniristilippumme. Lippukäsitteen selvittelyä ja historiikkia sekä lipunkäytön ohjeita. Helsinki: Itsenäisyyden Liitto. Villstrand, Nils Erik. 2006. ‘Kielirikka vapauden ilonmaljassa. Vapaussodan aloittamisen muistopäivä Vaasassa vuosina 1919-1938’, in Petri Karonen and Kerttu Tarjamo (eds. ), Kun sota on ohi. Sodista selviytymisen ongelmia ja niiden ratkaisumalleja 1900-luvulla. Helsinki: SKS. Volkan, Vamik D. 1988. The Need to Have Enemies and Allies: From Clinical Practice to International Relationships. Northvale, NJ and London: Jason Aronson. Volkan, Vamik. 1997. Bloodlines: From Ethnic Pride to Ethnic Terrorism. Boulder, CO: Westview Press. Winter, Jay. 1995. Sites of Memory, Sites of Mourning: The Great War in European Cultural History. Cambridge: Cambridge University Press. Winter, Jay. 2006. Remembering War: The Great War between Memory and History in the Twentieth Century. New Haven and London: Yale University Press. Winter, Jay and Sivan, Emmanuel, eds. 1999. War and Remembrance in the Twentieth Century. Cambridge: Cambridge University Press. Source: Studies in Ethnicity and Nationalism 7, 3: 153–170.